The children read Dr. Seuss book, The Sneetches , to better understand concepts of discrimination, privilege, abuse of power, etc. They learned songs with social justice themes and made their own stars (an idea inspired by the Dr. Seuss book) to wear together while we marched toward the Lake Merritt Farmer’s market in song. The Colorful Mamas of the 99% group put the event together. I am very proud of them. I have been trying to creatively think of ways to talk about Black Lives Matter with my very young children since this past summer. Thankfully, this event gave me the tools I need to start building and producing age appropriate resources for preschool aged and elementary school aged youngsters. Ok, ABCnews7 and SFGate news media outlets were there to get the scoop on what was going on, taking photos, interviewing the organizers, and the kids participating. It was amazing (and also sad) to hear several young children actually say that they wanted to make sure their siblings, as well as non-white friends, are treated fairly and with love. There are children who DO know what is going on and have expressed their concerns about they themselves and/or family members being brutalized by the criminal justice system. So, I know one isn’t supposed to read comments, but afterABCnews7 andSFGate news posted the articles about the event, I eagerly went to their sites to read the stories. I foolishly thought that a majority of the comments would be supportive and that being in the SF Bay Area, which is supposedly the center of diversity and ‘but we aren’t racist like those southerners’ , I found the comments to be filled with vitriol, hate, and ignorance. Most of the commenters were disgusted that us parent were ‘brainwashing’ our children; we needed to simply teach our kids to abide by the law and not play the race card when we get into trouble. Huh? One commenter even cried ‘child abuse’ (Palm into face). Another commenter bashed the city of Oakland and expected that parents from Oakland would teach their children to become horrible citizens. Again, palm into face. Hello? When did teaching your kids to not be racist assholes become equated with brainwashing? Inspired by the Black Lives Matter movement, I recently decided to create and organize ”The Vegan Praxis of ‘Black Lives Matter'” conference. It is scheduled for April 24-25 2015 (http://www.sistahveganconference.com). 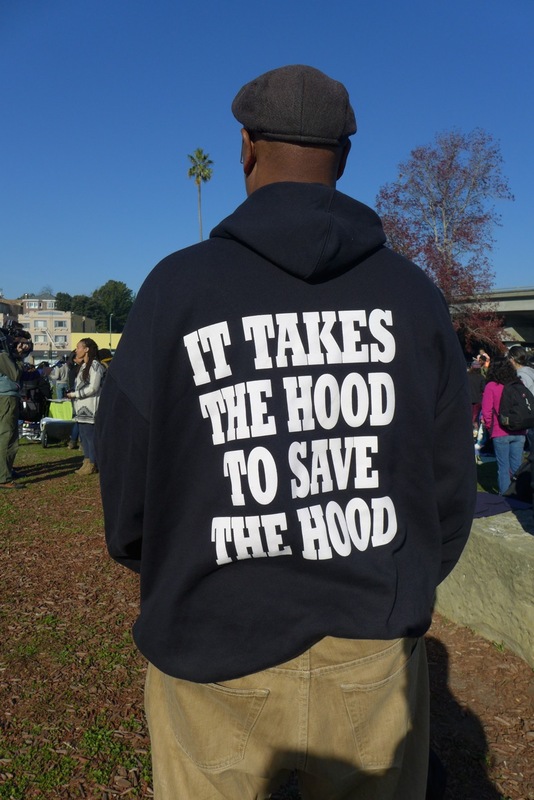 Since attending the Oakland story-time and teach-in event, the wheels have been spinning in my head. I now want to figure out how to convey the message of Black Lives Matter (within the context of veganism) to a very young audience for the conference (and for adults who care for young children). Anyone out there interested in doing that for this conference? I also began to think about how the mainstream ‘food revolution’ companies, gurus, service providers, etc., rarely, if ever, incorporate anti-racism into their goals. Nor do I ever see much needed critiques that question neoliberal whiteness rhetoric imbued in the current globalized capitalist economy that the vegan commodity chain is anchored in. Just recently, I contacted a white male vegan who seeks to revolutionize eating through holistic veganism. I explained that I look at how race and gender impact one’s concept of veganism, ethical eating, consciousness, etc. His response was, “Huh? What do race and gender have to do with veganism?” I directed him to my dissertation. Why repeat what has already been written? I get these comments and questions a lot and end up directing folk to my dissertation. After, I usually only hear crickets, as I did with him. 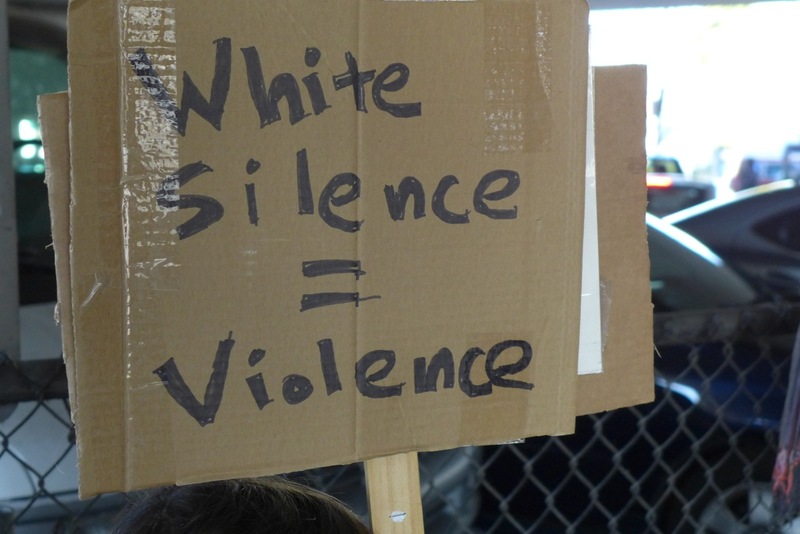 A protestor’s sign from the January 3 2015 event. I am looking forward to the Sistah Vegan conference. If you enjoyed reading this, as well as other projects I have done, please consider becoming a monthly donor or making a one time pledge to support this work, my new book project, conference, etc. Just yesterday, I was trying to figure out how to explain that gender and race are social constructs designed to keep some people down and elevate others…to my six year old. I long for the tools to teach this well.